Full of buzzing noisy guitars that trace their lineage back through a jagged line connected byth’ Faith Healers, Pixies and Wire, Witching Waves second album Crystal Cafe is sure to of interest for folks who like noise rock with gashes of melody and ambient interludes. The band have professed a love of Sleater-Kinney, Dischord Records and Beat Happening and there is certainly a DIY aesthetic to their music. It’s raw sounding but their talent shines and rounds a lot of the rougher edges. Opener Twister features a swirling riff and Emma Wigham singing. Seeing Double switches to Mark Jasper singing /shouting. Back and forth it goes at a herky-jerky pace with a couple instrumental interludes that give you some time take stock and reflect right in the middle of the maelstrom. If Kurt Cobain were still alive I could see him championing Witching Waves either by sporting a WW t-shirt or mentioning them in passing during an interview. As it is, they’ll have to rely on a few blogs and the digital underground to pass the word on about how great this is. Crystal Cafe is out on HHBTM in the US and Soft Power in the UK. Take a little bit of Ladybug Transistor and some Pelle Carlberg and the Bee Gees and you get an idea of what Stockholm, Sweden’s Moon Types are up to on their debut single. Moon Types remind me of a time not long ago when every week featured a new band from Sweden. It’s cooled down a little since those days, I suppose all of those bands like Park Hotell, Popundret, Boolteans, Carpet People, Liechtenstein, Wannadies, Rough Bunnies andShout Out Louds have all hung up the rock and roll spandex to settle into lives out of the indiepop spotlight. Know the Reason features a wonderful trumpet and a jangly riff that could thaw the iciest of hearts. Nothing’s Holy and Do It All Over Again have a slight country tinge to them, but it’s Swedish country so they kick up a different sort of dust. It’s nice to see there’s a new band from Sweden pick up the indiepop torch again. You can stream and buy Moon Types’ single from their record label Jigsaw Records. Click through for their best of the year list! As Elvis Costello once and, “accidents will happen” Athens, Georgia’s Tunabunny found a synthesizer in the garbage heap and infused their indierock with some art school blips and bleeps and came up with one of the catchiest, funnest sounding records of the year. Oakland, California’s Lunchbox fluctuate between calling themselves Birds of California and Lunchbox. Who cares what they call themselves when they make records this good. Lunchbox Loves You is full of sugary pop that is guaranteed to put a skip in your step. They hit a number of classic 90’s indiepop reference points including Stereolab, Apples in Stereo, Rocketship and Sprites while sounding still sounding fresh and new. You never know what someone is going to throw away. Not everyone can be bothered to put their junk up for sale on Ebay. Athens, Georgia band Tunabunny recovered a “sound input device” from the garbage heap. Now a sound input device could be anything, right? In Tunabunny’s case it appears to be electronic in nature that has the ability to create synthetic sounds: loops, dots, blips, and other various and sundry glitchy sounding things. So the band are finally diving into a vast new kingdom of technology by accident. Of course, some of the greatest things ever discovered by man were by accident, right? Peanut butter and jelly, velcro, viagra, and now Tunabunny’s re-imagine themselves on their fourth album. The previous three records were strictly guitar bass drums but now that they fished their very own “Echo” out a dumpster they sound like they’ve been re-energized with new possibilities and song structures. Save It Up sounds like Black Box Recorder while Power Breaks reminds me of something from Peter Gutteridge‘s Pure cassette. The band do restrain themselves and don’t let their new device totally take over the ship. Coming For You is vintage Tunabunny with the just the right amount of pop smarts and noise. 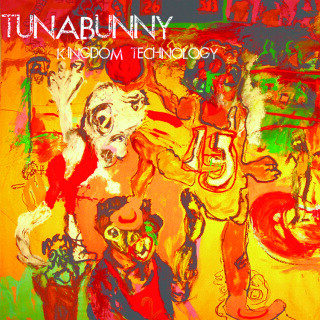 Kingdom Technology is the most fun Tunabunny have sounded yet.